A tension headache is a diffuse, mild to moderate pain in your head that's often described as feeling like a tight band around your head. Although this is the most common type of headache, its causes are not well understood. • The pain is like tightness around the hat band area. Some of them feel a squeezing feeling or pressure on their head. It usually occurs on both sides of your head and often spreads down your neck or seems to come from your neck. At times, it's just on one side, and the pain is usually moderate to mild and sometimes, it can be severe. • This type of headache can last from 30minutes to 7 days. • It normally comes during the day and gets worse as the day goes on. • There are usually no other symptoms. 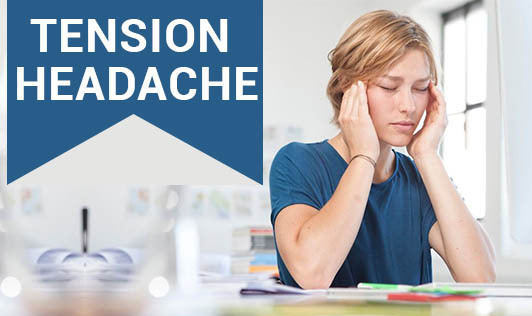 Some people don't like bright lights or loud noises and have a loss of appetite when they have a tension type headache. The cause for this type of headache is not clear, however, it's most probably due to tension. This is why the term "tension type headache" is now used rather than tension headache. Some may be triggered due to emotional tension, anxiety, tiredness or stress. Physical tension in the scalp or neck and physical factors such as bright sunlight, heat, noise, cold etc can also cause tension type headache. Research also suggests that one's genetic make-up may be a factor. • Keep a diary if you have frequent headaches and note when, how, where and how bad each headache and how long each headache lasts. Make it a point to note anything that has caused it. A pattern may emerge and you may find a trigger to avoid in future. • Stress can be a trigger for some people who develop tension type headaches. Learning to cope with stress and to relax may help. Breathing and relaxation exercises and coping strategies may reduce anxiety in stressful situations and prevent a possible headache. • If you do not exercise, it may be worth a try. Activities like brisk walking, jogging, swimming, cycling can help you be fit and healthy. It can ease the tension and stress which can have a knock-on effect of reducing tension type headaches. • Painkillers and other medication are given based on the severity of the condition. • Lastly, living a healthy lifestyle may help prevent headaches. Living with chronic pain can be difficult, contact your physician if you're experiencing tension type headache.